Data Wrangling: Combining Slightly Different Datasets — Kimberly Coffey, Ph.D.
A group of Medicare providers can voluntarily come together to participate in the program as an “Accountable Care Organization” (ACO). Medicare generates a “benchmark” of what it would expect to pay the ACO in expenditures in a given year, based upon historical data, the type of patients the ACO treats, expected changes in the cost of treatment, etc. The program is a three-year commitment for the ACO. The program started admitting ACOs in 2012, but for those ACOs, their “first year” included 2013. The results of the program – consisting of financial and quality-of-care data about participating ACOs – is publicly available for the 2012-2013, 2014, and 2015 years via the data.CMS.gov website. Below, I import the results data for the 2012-2013, 2014, and 2015 years of the Shared Savings Program using the Socrata API. Throughout this post, I occasionally refer to this data as results data, to distinguish it from some other data we’ll also use. Unfortunately, the ease of importing the data is matched only by the challenge of deciphering it once you have it. The Centers for Medicare and Medicaid Services (CMS) does not release a data dictionary for the data, with a concise guide as to what each field means and how it was calculated. Instead, the information necessary to understand the data is distributed across multiple different documents posted online, in different places, on the CMS website. Not all documentation is available for all years. In some cases, variable names changed slightly or completely over time. The quality-of-care measures used in 2015 changed, such that some previous items were dropped and new ones were added. Lastly, the task of tracking the same ACO over time in the program is complicated by the fact that the ACO names in the data were sometimes entered in slightly different (e.g., “BALANCE ACCOUNTABLE CARE NETWORK” vs “BALANCE ACO”) or dramatically different ways (e.g., “TRIPLE AIM ACCOUNTABLE CARE ORGANIZATION” vs “COMMUNITY HEALTH NETWORK”) across years, rendering name an unreliable identifier. The first thing I like to do in a situation like this is create a table that assembles all of the different ways of referring to a given entity in one place, and assigns a unique identifier to the entity. In this case, the 2015 data actually does include a field with what looks to be a unique identifer for each ACO (“aco_num”), but neither the 2012-2013 nor the 2014 dataset have this field. After hunting around data.CMS.gov, however, I discovered that there are a couple of “public use files” (PUFs) for the Shared Savings Program that include the aco_num field, in conjunction with the ACO’s name as it appears in the data that year, for both the 2012-2013 and 2015 data. As of this blog post, there was no PUF posted for 2014. 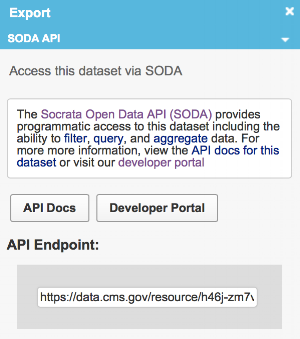 Below, I use the Socrata API to pull the two available PUFs into R.
# Note that (as of this posting), the PUF files are only available for 2013 and 2015. Our master file will have each ACO’s unique identifier (“aco_num”) and the name associated with the aco_num in the 2013 and 2015 data. I also include the date the ACO entered the program (the “agreement_start_date”), because the start date shouldn’t change over time, so matching by it AND name increases the likelihood of a correct match. To clean up the ACO names, I convert them all to uppercase, drop the suffix “LLC”, and trim any extra blank spaces before or after the ACO name. (When merging by name, R will treat white space as part of the character string and fail to match “ACO NAME” with “ACO NAME” if I don’t do this.) The results data and the PUF data have slightly different variable names for the agreement start date, so I also ensure that the nomenclature is consistent. So, I’ve just cleaned up the 2012-2013 PUF file and prepared it for the master. The next step is to do the same thing to the 2012-2013 results data, and make sure we’ve got an aco_num for every ACO listed in the 2012-2013 results data when we merge by name. You might think this is redundant and an unnecessary step – after all, would the ACO names be captured differently in the 2012-2013 PUF file and the 2012-2013 results file? Unfortunately, yes. In some cases they are. This merge produces a list of 267 names, even though both files only had 220 names and they should be identical. This means that the ACO name sometimes appears differently even in files for the same year. ACO names with no corresponding aco_num appeared in the results file but their name was written differently there than it was in the PUF file. Next, I do a quick quality check on the 2015 data. We discovered with the 2012-2013 data that the ACO names were not printed consistently in different data files for the year. The following code snippet checks the 2015 data and discovers, delightfully, that the names are uniform in the 2015 data files and that, furthermore, the aco_nums printed in the different files match. # Quality control check: Merge 2015 data sources. Produces a list of 392 ACOs, exactly as it should be. # Quality control check: The aco_nums in the PUF all match the aco_nums in the results file, when merging by name. The next challenge is to clean up the actual results data for each year, so we can combine the different years of data and compare results across years. I start by adding a year variable to the results data files, because this information isn’t explicitly represented in the data. Now we need to make sure that the same variables are called the same thing across years. For example, the field with each ACO’s name is called "aco_name_lbn_or_dba_if_applicable" in 2013, “aco_doing_business_as_dba_or_legal_business_name_lbn” in 2014, and “aco_name” in 2015. I use the 2015 name. There’s no good way to automate this, so I just manually make changes to a couple of the most important variables. The 2012-2013 data and the 2014 data have an underscore (“_”) in the quality-of-care variable names, but the 2015 data omit this underscore. I find the item numbers a little easier to read with the underscore, so the code snippet that follows pulls all the quality-of-care item names in the 2015 data, adds in the underscore, and re-assigns them to the variables. The next challenge involves identifying the variables that are common to all three datasets and putting them in the same order, so we can cleanly bind all of the data together. This is a particularly important task because the quality-of-care measures changed between 2014 and 2015. (The 2015 quality-of-care measures omit 8 of the previous items and add 8 new ones.) The models I'll be using in the next post to assess any changes in quality-of-care over time require a minimum of three assessment points, so I'll only want to use those items for which all three years of data is available. The following code pulls the variable names for all three years of data, and then - using the incredibly efficient and concise “Reduce(intersect, ))” command – returns a list of the common variables that occur in all three datasets. I use this list to subset the datasets, re-order them so the variables are in the same order in all three datasets, and then bind the rows of data to each other (using “rbind”), creating one large dataset. We now have all the data together, in one place! From now on, any changes we make to the data (such as adding new variables, making sure numerical variables are recognized as numbers, etc. ), only have to be made once. First, I add in a variable to track the ACO’s year in the Shared Savings Program. ACOs that started during 2012 had a longer “first year” in the program that included 2013, so we can consider that the 2012-2013 data represents these ACOs’ first year of the program. I also re-order the variables so the order makes a little more sense to me when I view the dataframe. This is purely a personal preference. Clean up the ACO names in the data file, to give the names an optimal chance of matching during each merge. Rename the aco_name field in the data file to “aco_name_2013”, and merge with the master file by the 2013 PUF name for the ACO (plus their agreement_start_date, for additional confidence that we’ve got the right match). I specify during the merge that all the entries in our combined data file must be preserved (merge(master.temp, data, by=c("aco_name_2013", "agreement_start_date"), all.y = TRUE)), so even if an entry with a name appearing in the data file has no match in the 2013 PUF file, it won’t get cut from the data file during the merge. All ACOs will now have an aco_num except those with mismatched names between the 2013 results file and 2013 PUF, and those who entered the program in 2014 or 2015. Now re-name the aco_name variable in the data file to “aco_name_2015”, so we can merge by the 2015 name for the ACO. Once again, we’re preserving all rows in the data file, regardless of whether they have a match in the master file, so no information is lost in this process. I also add suffixes (suffixes = c("_2015","_2013")) for the variables with duplicate names in both files, so we can identify where the variable came from. Confirm that when both aco_num_2013 and aco_num_2015 are populated for an ACO, the two aco_nums match. They do. We can now proceed to Step 5 with confidence. Re-create the aco_num field in the data file, using either aco_num_2013 or aco_num_2015, depending upon what’s available. Sort by aco_name and manually check rows with missing aco_num data against the preceding and subsequent rows. If the entry with the missing aco_num has a name that could plausibly be the same as the previous or subsequent entries (e.g., “HCP ACO CA” vs “HCP ACO CALIFORNIA”), their agreement_start_dates match, and their year_in_program data suggests that they could be the same ACO over different years in the program, manually impute aco_num data. There will still be some rows with missing aco_num data, unfortunately. We’ll keep these rows in the dataset, so we can include them for broad year-over-year comparisons, but we won’t be able to use them for modeling the impact of the Shared Savings Program on ACOs over time. Double-check that no aco_num has more than one year of data for each year in the program. If there were an aco_num that had two or more entries for, say, the second year in the program, this would suggest that we’d either made an error somewhere or that CMS had assigned the same aco_num to different ACOs. Fortunately, this check confirms that everything looks right. # Now have two aco_num columns, based upon whether the aco_num was merged in using the 2013 or 2015 name for the business. # When the name stayed consistent in both years, both columns will be populated. # Step 4: Confirm that when both columns are populated for a business, the results match. They do. # Step 6: Manually check rows with missing aco_num data. # suggest that these are subsequent years for the same ACO, manually impute aco_num data. data$aco_num[data$aco_name=="HCP ACO CA"] <- "A71307"
data$aco_num[data$aco_name=="JFK POPULATION HEALTH COMPANY"] <- "A06665"
When we imported the data, most of our numerical variables were converted to character variables. In addition, there were a couple of numerical variables with “%” or “$” formatting that caused them to be treated as strings. This code fixes these issues. All of the quality-of-care items should be numerical, so I handle them in bulk with a for loop. Below, I double-check my understanding of some of the variables in the dataset by re-calculating them myself and making sure my values match the ones in the dataset. I also check that the scaling for the quality-of-care items was consistent across years, which it looks to have been. # SO GLAD I DID THIS!! # Delightfully, the scaling for QOC variables looks to be consistent across years. Lastly, I’m adding a new variable that represents whether or not an ACO received a payout (for being meaningfully under their benchmark) in a given year.